We analyse the anisotropy present at different scales in rotating homogeneous turbulence. The Zeman wavenumber $k_\Omega$ [O. Zeman, “A note on the spectra and decay of rotating homogeneous turbulence,” Phys. Fluids 6, 3221 (1994)] was introduced to quantify the effect of nonlinearity compared to the Coriolis force, and was proposed as a threshold to separate the anisotropic subrange, at scales $k\ll k_\Omega$ (largest scales), from the isotropic subrange at $k\gg k_\Omega$. We study the nature of anisotropy and the role of the Zeman wavenumber using high resolution direct numerical simulations of freely decaying rotating turbulence, for various initial Rossby numbers. The anisotropy is analysed scale-by-scale by considering the angle-dependent energy spectrum, which characterizes directional anisotropy as a tendency to selectively accumulate energy towards the transverse waveplane $ k_\Vert = 0$. This ring-to-ring anisotropy is shown to develop in a non-monotonic way from small to large wavenumbers, first increasing, then decreasing. The Zeman wavenumber appears to be a suitable scale for estimating the separation between anisotropic and isotropic ranges. Consistently, when $k_\Omega$ is larger than the dissipative wavenumber cut-off, even the smallest scales are significantly anisotropic. 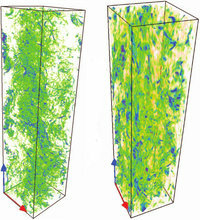 This situation occurs eventually in our simulations of freely decaying turbulence, and is also observed in recent experimental results. Our investigation of anisotropy is completed by analyzing the angle-dependent nonlinear energy transfer and separate poloidal and toroidal energy spectra. The excess of poloidal energy in the equatorial plane $ k_\Vert = 0$ is linked with more energetic vertical motion.